South Africa had not lost in their last seven matches at Johannesburg, nor had they ever lost on Pink Day. Pakistan had suffered two defeats on the trot and had won only once in nine games at the ground. Their skipper was banned for four games at the beginning of the match and they were struggling to get their selection right. Then they delivered a statement win. And the statement was loud and clear: we are special. Right from the start, they were like a pack of hungry, rabid dogs continuously biting away at their prey. 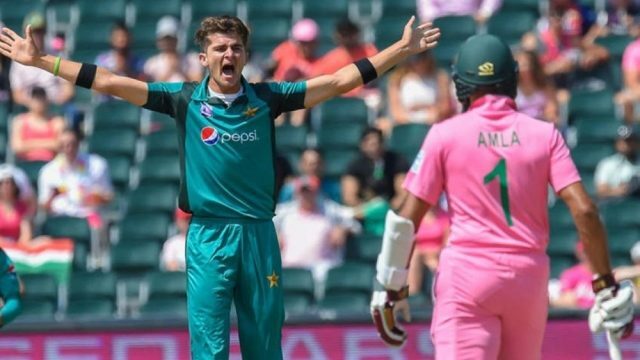 Young Shaheen Shah Afridi drew first blood. And second blood too. South Africa were two down and reeling but they had Hashim Amla and Faf du Plessis out there in the middle. They steadied the ship, and their partnership grew and grew. Then Shadab Khan beat Du Plessis in the air and the dipping delivery caught him in front of the wicket. It was out, but it was not given. Pakistan usually crumble under such bitter disappointment. Resilience seldom comes naturally to the mercurial. But then came the statement: we are special. It was Shadab again. It was Du Plessis again. It was the sweep again. And it was the failure to read the flight of the ball again. The last one went under the bat, this one took the top edge. Mohammad Hafeez — the very definition of swagger in his pink shades — jogged in to take the catch. Blood leaked once more, and this time there was to be no let-off. Shadab and Imad Wasim had worked together to suffocate Amla and Faf. It was only fair that Imad would account for the other part of the pair. In his final over, Imad got the ball to crash into Hashim Amla’s stumps. The spinners had done their bit. Way too often, it’s either the spinners or the pacers who do the job for Pakistan — one or the other, but seldom both. But then came the statement: we are special. Mohammad Amir, who hadn’t taken a wicket in seven games, crashed the ball into David Miller’s pads. South Africa’s tail was almost exposed. Usman Shinwari seemed to be having an off day in his first two spells. When Pakistan bowlers have off days, they have spectacularly bad off days. But when Pakistan bowlers have good days, they have spectacularly good days too. The left-armer transformed the cricket ground into a canvas of absurdism, bowling six balls that read ‘wicket, zero, wicket, wicket, zero, wicket’. Pakistan were set just 165 to win. It was supposed to be the simplest of chases. But there’s no such thing as a simple chase for Pakistan. And then came the statement: we are special. Those who can’t understand someone reading into a 165-run chase haven’t seen Pakistan over the years. Here there were no hiccups and perhaps the only time Pakistan looked ill at ease during the run-chase was when they needed the final run. Fakhar Zaman provided a timely reminder of his timing, while Imam-ul-Haq and Babar Azam continued their stellar series. This was effective and this was efficient. This was special. The series now stands at 2-2 and Pakistan can count themselves slightly unlucky in the two matches that they lost — finding themselves once at the wrong of an inspired Andile Phehlukwayo and once at the wrong end of rain. In both games, they gave a very good account of themselves but could not capitalise at the crucial moments. Stand-in captain Shoaib Malik had recently said Pakistan can win this year’s World Cup in England. Under his captaincy, they showed in no uncertain terms that the veteran batsman’s confidence is not ill-founded. A young and vibrant top-three who all boast averages in excess of 50, an experienced middle-order that has seen it all, a variety of superb all-rounders capable of deciding matches with both bat and ball mixed in with an entire army of deadly pacers. Pakistan have all the ingredients needed to be considered one of the favourites in every limited-over tournament they play. Sarfraz Ahmed and his men have already achieved some incredible feats in both limited-over formats, but they must now deliver in the upcoming World Cup — the biggest stage of them all. That is where they must make their claim of being truly special, of being counted among the finest limited-over teams of all time.